The Tatmadaw must always try to strengthen its defence power to be able to protect the country. The Tatmadaw must be strong and capable. And the Tatmadaw must be built through training to become skillful, Commander-in-Chief of Defence Services Senior General Min Aung Hlaing told the officers and other ranks who participated in the joint military exercise (Hsinbyushin) of the Tatmadaw (Army, Navy and Air) at Pathein Station this morning. 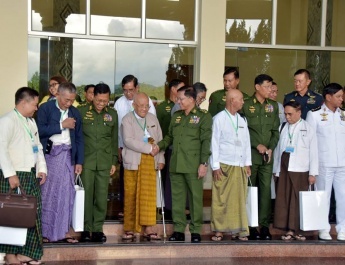 The Senior General viewed the second session of the joint military exercise (Hsinbyu-shin) of the Tatmadaw (Army, Navy and Air) being conducted at Pathein Station of South-West Command so as to increase combat skills in conventional wars for national security and defence. Also present on the occasion together with the Senior General were Commander-in-Chief (Navy) Admiral Tin Aung San, Commander-in-Chief (Air) General Maung Maung Kyaw, senior military officers of the Office of the Commander-in-Chief, the commander of South-West Command, members of Tatmadaw (Army, Navy and Air) corps and reporters from local news agencies. First, the Senior General and party arrived at the viewing deck for landing operation. Next, the exercise started as scheduled and river-crossing operation team, naval special operation team, infantry unit and armoured troops conducted river-crossing operation. At the same time, troops from the Tatmadaw (Air) carried out search and rescue operations in the battlefield. Meanwhile, special troops hanging from a helicopter unexpectedly raided the enemy camps. Then, air force troops parachuted from an airplane and raided the enemy’s administrative and logistics camps. 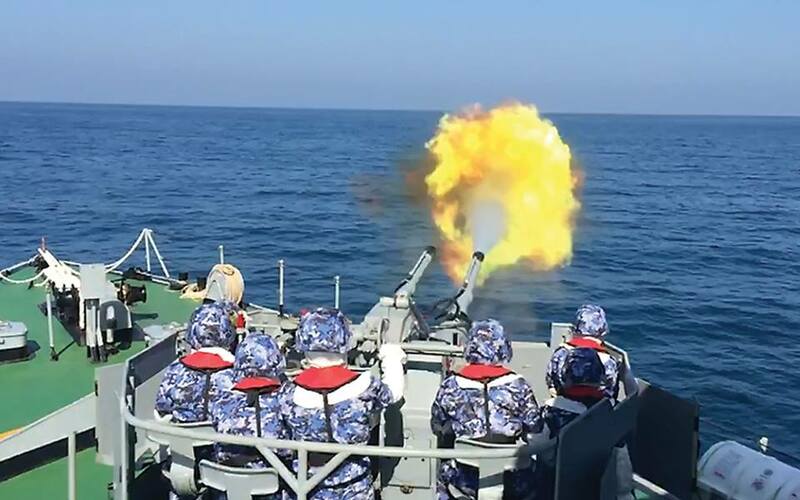 The Jet fighters and helicopters from the Tatmadaw (Air) attacked the respective enemy targets, canons were fired, infantry troops and armoured troops made a beach landing and warships from the Tatmadaw (Navy) opened fire at the reinforced enemy ships. Then, landing troops raided the enemy camps and crushed and occupied the respective enemy targets. Then, exercise concluded after the dropping of ammunition and rations from the airplane, carrying of wounded troops by ambulances and the airlifting of emergency patients. 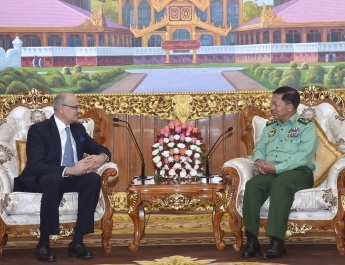 Speaking on the occasion, the Senior General praised the officers and other ranks from the Tatmadaw (Army, Navy and Air) for their cooperation and successful conclusion of the military exercise. Then, the Senior General said it was necessary to review the experience from the exercise and take lesson from the weaknesses. Such joint military exercise of the Tatmadaw (Army, Navy and Air) was held twice 20 years ago. The Tatmadaw has to make preparations for the joint military exercise. 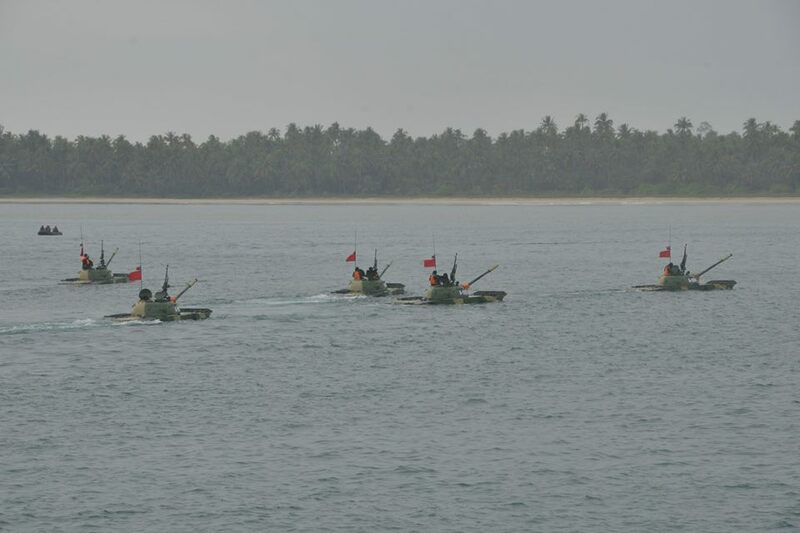 The Tatmadaw units (Army, Navy and Air) did the joint military exercise based on training experiences. The country’s defence duty cannot be done in a hasty manner. It needs systematic preparations, formation and trainings. Each serviceman, unit and battalion has to undergo training. 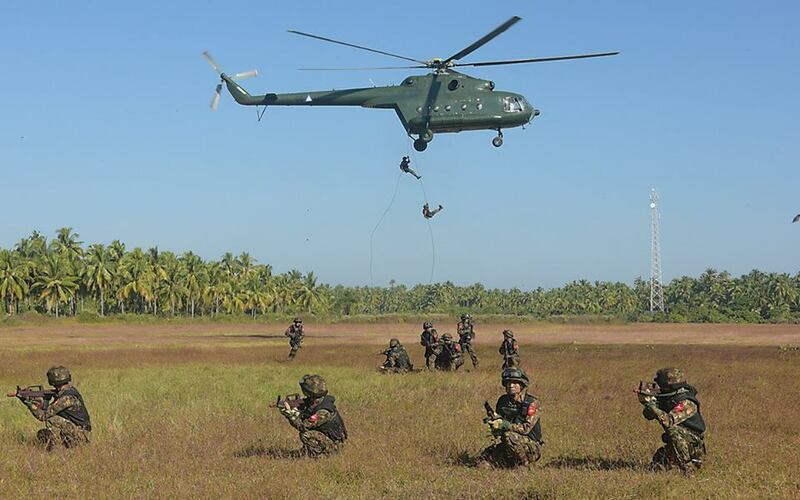 Finally, all Tatmadaw (Army, Navy and Air) units have to conduct the joint training step by step. The nature of the warfare is always changing. We need to keep pace with it. Military strategies have changed day by day due to the production of modern military equipment. So, we need to study changing technologies in order to apply them. Servicemen need to adhere to our training policy: Always study the matters, always undergo training and always follow disciplines. Not only our country but also other countries are undergoing such trainings. 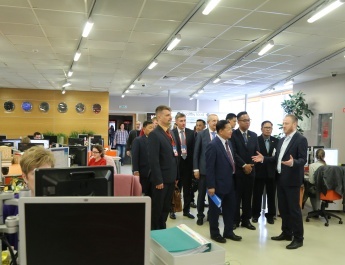 These efforts aim to safeguard their countries. It is the duty of all armed forces. For the country which lost independence, Myanmar needs more defence capacity and power. The country lost independence as it lacked a modern Tatmadaw and had weak unity. It is found that all small countries which face the threats from superpowers have made preparations for their defence. The countries with weak defence prowess may face insults and threats. For independence struggle, the Thirty Comrades led by General Aung San learned the military arts in Japan and then formed a modern Tatmadaw. The country regained independence as the Thirty Comrades struggled for independence by joining hands with the people. Since the independence period to date, the Tatmadaw has been steering the country’s situations. So servicemen always undergo training in order that the Tatmadaw becomes the skillful one. In doing so, servicemen themselves are to do training to become healthy, fit, skillful and brave ones. Being skillful and harmonious coopera-tion play a crucial role in the joint military exercise of the Tatmadaw (Army, Navy and Air). 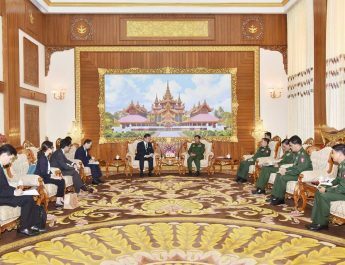 Chief of Armed Training Forces Lt-Gen Maung Maung Aye presented an emblem for the joint military exercise of the Tatmadaw (Army, Navy and Air), to Senior General Min Aung Hlaing. Afterwards, the Senior General cordially greeted media and replied to their questions. 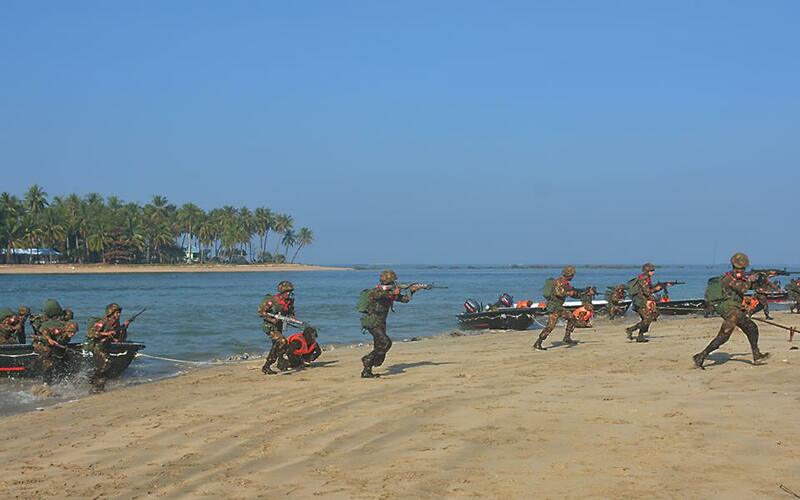 As the second session of the joint military exercise of the Tatmadaw (Army, Navy and Air), the beach landing exercise was held today.